surname : pertaining to the carpenter clan. 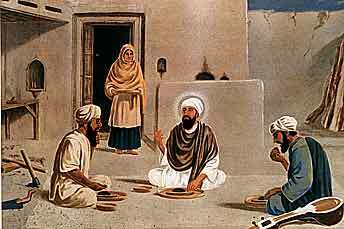 bGuru Nanak Dev Ji took Bhai Lalo’s dry chapati in his right hand and Malik Bhago’s fried sweet pancake in his left hand. When he squeezed the right hand the people present there saw drops of milk dripping from it. And when he pressed the left hand with the Malik Bhago’s fried pancakes, everyone saw blood trickling from it. Malik Bhago was silent on seeing all this. Bhai Lalo on the other hand was the symbol of honesty and hardwork. So according to Guru Nanak Dev Ji it’s better to earn little money with honesty than to amass a huge wealth by devious and crooked means.